The Audi e-tron prototype combines enormous power and high efficiency. With a system output of up to 300 kW, the full-size SUV with a fully electric drive accelerates from zero to 100 km/h (62.1 mph) in less than six seconds. In the WLTP test cycle, it covers more than 400 kilometers (248.5 mi) on one battery charge. One important factor for the long range is the most innovative recuperation concept among the competitors. 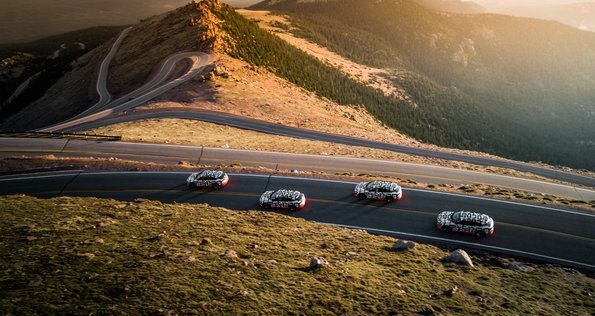 The electric SUV proved this with an impressive performance at Pikes Peak. 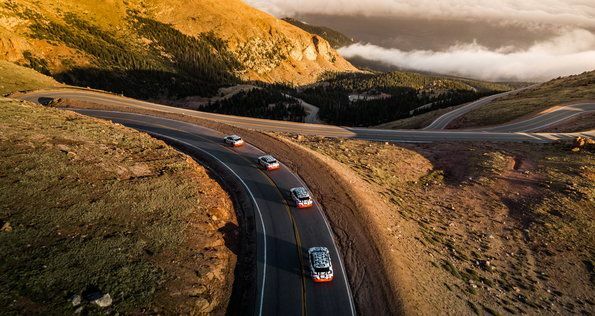 At 4,302 meters (14,115 ft), Pikes Peak looms high in the southern Rocky Mountains. Where Walter Röhrl won the world’s most famous hill climb in the Audi Sport quattro S1 back in 1987, it is the Audi e-tron prototype that is now causing a sensation with its recuperation system that is variable and thus the most efficient among all the competitors. On its 31 kilometer (19 mi) downhill drive, the electric SUV feeds so much energy back to the battery that it can cover approximately the same distance again. The difference in altitude of about 1,900 meters (6,233.6 ft) provides the necessary conditions for this. 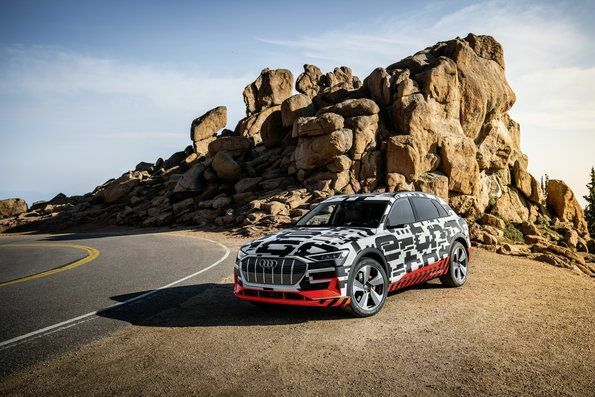 The Audi e-tron prototype recuperates energy with up to 300 Nm of torque (221.3 lb-ft) and 220 kW of electric power – more than 70 percent of its operating energy input. No series production model has achieved such a value up to now. The recuperation system contributes to up to 30 percent of the electric SUV’s range. It involves both the two electric motors and the electrohydraulically integrated brake control system. For the first time, three different recuperation modes are combined: manual coasting recuperation using the shift paddles, automatic coasting recuperation via the predictive efficiency assist, and brake recuperation with smooth transition between electric and hydraulic deceleration. Up to 0.3 g, the Audi e-tron prototype recuperates energy solely via the electric motors, without using the conventional brake – that covers over 90 percent of all decelerations. As a result, energy is fed back to the battery in practically all normal braking maneuvers. The driver can select the degree of coasting recuperation in three stages using the steering wheel paddles. At the lowest stage, the vehicle coasts with no additional drag torque when the driver releases the accelerator pedal. At the highest stage, the electric SUV reduces the speed noticeably – the driver can slow down and accelerate using only the accelerator pedal. This creates the one-pedal feeling. There is no need to use the brake pedal in this deceleration scenario. The wheel brakes are involved only when the driver decelerates by more than 0.3 g using the brake pedal. They respond extremely quickly, thanks to a new electrohydraulic actuation concept. Audi is the first manufacturer worldwide to use this concept in a series production vehicle with electric drive. A hydraulic piston in the compact brake module generates additional pressure and thus additional brake force for the recuperation torque. When automated emergency braking is performed, there are only 150 milliseconds between the initiation of the deceleration and the presence of maximum brake pressure between the pads and disks. Thanks to this rapid pressure buildup, the braking distance is shortened by up to 20 percent compared with a conventional brake system. 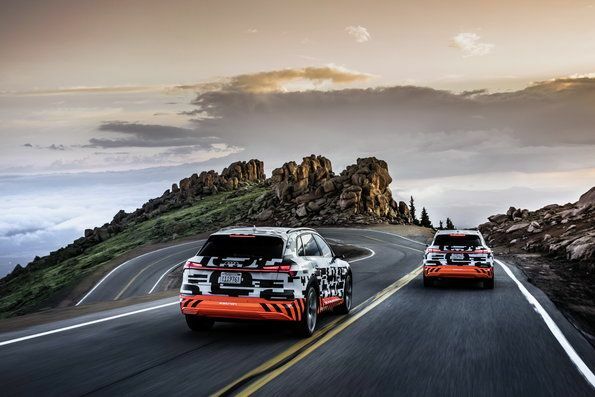 Depending on the driving situation, the electrohydraulically integrated brake control system decides – electrically on each individual axle – whether the Audi e-tron prototype will decelerate using the electric motor, the wheel brake, or a combination of the two. The brake pedal is decoupled from the hydraulic system. The transition from the engine brake to the pure friction brake is smooth, and the driver does not notice it. This system allows the electric SUV to exploit its maximum recuperation potential in a targeted manner with support from the standard efficiency assist. 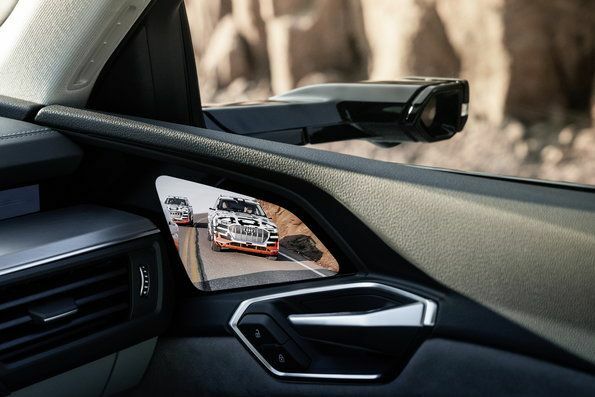 The system uses radar sensors, camera images, navigation data and Car-to-X information to detect the traffic environment and the route. The driver is shown corresponding information in the Audi virtual cockpit as soon as it would be sensible to take the foot off the accelerator pedal. By interacting with the optional adaptive cruise assist, the efficiency assist can also decelerate and accelerate the electric SUV predictively. What is fascinating about the SUV with electric drive is not just its efficiency but also its performance. Its two electric motors have an output of 265 kW and develop 561 Nm (413.8 lb-ft) of torque. They can deliver this peak performance for up to 60 seconds. This way, they allow the vehicle to accelerate from a standstill to the electronically limited top speed of 200 km/h (124.3 mph) several times consecutively without output losses. The maximum drive torque is present within fractions of a second and provides enormous torque. By shifting from drive range D to S and fully depressing the right-hand pedal, the driver can activate boost mode. It is available for eight seconds. Here, the drive produces 300 kW of system output and 664 Nm (489.7 lb-ft) of torque. 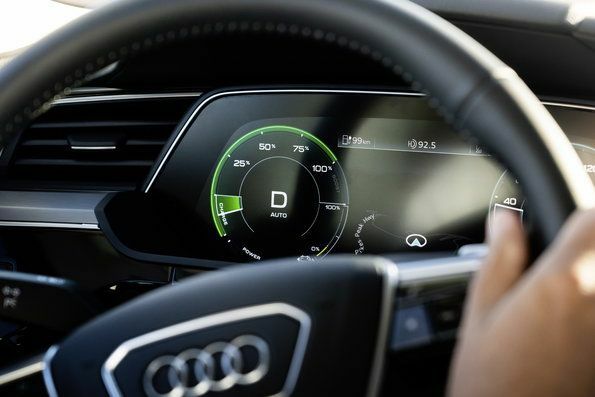 The Audi e-tron prototype sprints from 0 to 100 km/h (62.1 mph) in less than six seconds. McLaren CEO calls for new "weight race "